It was pitch-black dark when my train pulled into Zagreb from Villach, Austria on May 30. The day before, I had notified the Hotel Dubrovnik in Zagreb that I would be arriving late. I headed straight for an ATM in the train station so I could get some local currency...the kuna is the official currency here. Even though Croatia is now part of the European Union, the euro has not yet been adopted. Emboldened by a full purse, I flagged down a taxi and headed straight to the hotel. It was so close I probably could have walked, pulling my carry-on bag. But, given that it was 10 pm and I was alone, I got the cab. It took only about 5 minutes, including a couple of extra trips around the block the cabbie took. The hotel was surprisingly new, though it was right in the middle of the old city. Cafes and bars were all around, and they were bustling. Apparently, people were still eating dinner. So after checking in, I went directly to a cafe downstairs and ordered a salad and a glass of wine. Much to my relief, the waiter spoke English. I did not yet know a word of Croatian. We were briefed by our two young Croatian guides, Mischa and Hrvoje (most of us called him Mr. H). We would travel by van roughly north to south, stopping to experience Croatia’s vastly different landscapes. 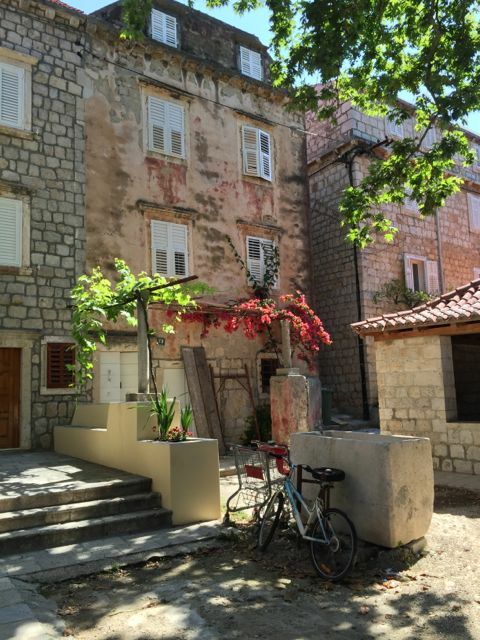 We would hike through alpine meadows of the Velebit Mountains, cycle through valleys graced with small towns and vineyards, kayak on crystalline rivers, and sail to some of the 1,200 the islands along the coast of the Adriatic Sea. But first we had a day or two to spend in Zagreb, a marvelous city in the sense that, just when you feel you’ve stepped back through a time warp into a medieval era, you suddenly encounter street art so contemporary that it makes you realizeyou’ve been missing something big back in the States. I could have stayed another two weeks and been completely captivated. Open air cafes sprawl throughout Zagreb, filled with people talking enthusiastically face-to-face. They’re not all on their cellphones. So, it was a great place to hang out, have dinner or a drink and chill. Lots of markets, shops, and unexpected happenings. One evening my roomie Erin and I had stepped out for a drink after dinner when we encountered some sort of Catholic religious procession. It started with a few hundred people holding candles and singing chants, slowly walking through the plaza. Then slowly, thousands more passed by, including priests in full regalia from various orders, nuns and throngs more secular folks. It continued for at least an hour. It was a saint’s celebration I found out later. Earlier that day, we found two extraordinary museums. The first was the Croatian Museum of Naive Art, which I can honestly say I enjoyed more than some of the fine art museums I recently visited in Paris. The museum was founded in 1952 and shows paintings, drawings and sculptures of artists of the 1930s through the 1980s, focused on artists of the Croatian Naive and the Hlebine School. Maybe what appeals to me so much is the artists’ depiction of everyday people and natural landscapes, but with an unusual, somewhat surreal and child-like quality that communicates on a primeval level. See photo below of one of my favorite paintings....Smashing, baby! Before leaving Zagreb for a fast-paced and physically challenging adventure tour of Croatia, a scientist named Mate Zec briefed us about the natural areas we were about to see. Zec is employed by Association Biom, a nonprofit based in Zagreb and affiliated with Birdlife International, a nonprofit that manages 6,000 natural areas in 47 countries. Croatia is about the size of West Virginia. Some 25 percent of its land is arable farmland and about 40 percent is forested. Fifty percent of Croatia’s landmass is limestone karst. Riddled with caves and underground cavities, limestone karst stores and exudes enormous amounts of water in the form abundant rivers and waterfalls. 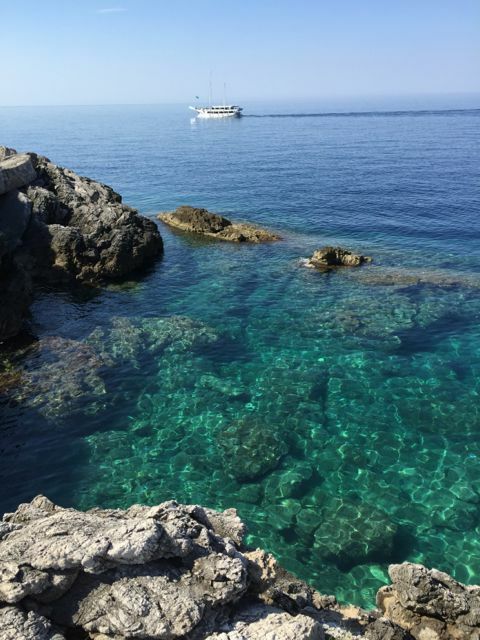 There is water everywhere in Croatia, and the water is mostly crystal clear and turquoise blue. And it’s not just pretty. You can still safely drink from some of these wild rivers. Our guides, Mischa and Mr. H were hardworking and informed young Croatian men who were also remarkably fit and expert kayakers. I had taken a sea kayaking class a few months before in Santa Cruz, and thought I was at least minimally prepared for the trip. But I had never used an inflatable kayak or a sit-on-top kayak or a double kayak. What’s more, I had never been river kayaking. The Sierra Club International group resting after a bike ride in Croatia. We set out in vans driving southwest from Zagreb toward Karlovac, where we and a gazillion other tourists that day who were visiting the famous Vlitpice Lakes National Park. This UNESCO protected area has more waterfalls and crystal clear lakes and pools than I have ever seen in one place, but it was jammed with tourists (like us), so we viewed it single-file and it felt like Disneyland. We were ready for a quieter natural experience. We moved west toward Rijeka and then cycled some 22 miles through rolling hills, villages and farmland, across the southern border of Slovenia. Spectacular! Back to Croatia, we continued south and west to the Velebit Mountains, strikingly unique karst mountains that rise in eroded spiral forms. We would complete a 9-mile hike up a slippery and stony trail with nearly vertical drop-offs, and then loll about on top in Alpine meadows. I took a nasty spill on this trail, thankfully before it got terribly steep and scary. Again, thankfully, I got up to find I had suffered only a skinned knee and a few bruises. After a short first aid stop, I got up and kept on trekking, trying to visualize my bandage as a badge of bravery, rather than a symbol of my frailty. I would, however, bow out of the next strenuous hike on the agenda, giving myself a day to rest and recuperate. It was a great decision because the guides parked me at a lovely local pub with great wi-fi and immensely refreshing freshly-squeezed lemonade. I was able to write and relax in the shade, thinking kind thoughts about the rest of the group hiking in blistering 90 degree heat. When they returned, they were all ready to eat a big lunch of fresh-caught mackerel at the pub. The owner served all 18 of us, going around the table and de-boning each person’s whole fish. He was such a master at this I took a video of his flying fingers as he deftly pulled the whole skeleton out of each fish. The next part of our trip would focus on water sports. One memorable day, we kayaked the Kryk River, home to Mischa our lead guide. He knew the river like the back of his hand, and I was lucky enough to share a double kayak with him. Not only did he do most of the work, he steered the kayak and told me exactly when to paddle and when to stop. Since our kayak was leading the group and I was sitting in the front with not a soul in sight, I took great pleasure in imagining myself as a sort of Hiawatha, exploring an undiscovered wild river. We’d cruise along for a while and then head down a rapid. Overhead, we saw an eagle soaring. It was perfect. At times, Mischa would get out of the kayak to direct the group, and he would have me paddle over to the streambank and keep the kayak there by hanging onto big tree roots along the bank. After we kayaked for several hours, Mischa led us to his parents’ home on the river, where his mother had prepared an amazing feast for the whole group. After lunch, Mischa brought us all over to view a rapid that we would take our kayaks over, if we so chose. I took one look at it and said “No frigging way!” The river was nearly 50 feet across and the rapid plunged some 9 feet down through a small rock gorge. But Mischa almost insisted that I do it. He had a way of giving one self-confidence. He knew the river so well and had guided loads of people over this rapid before. But mostly, I trusted him and so my fear just evaporated and I went for it. It was a complete rush. I did just what Mischa had instructed me to do, keeping my legs straight and holding my paddle up high until the designated moment, I piloted the kayak through the rapid effortlessly. A definite high point of the trip!!! One of my travel buddies managed to take a photo of me mid-rapid. See below. 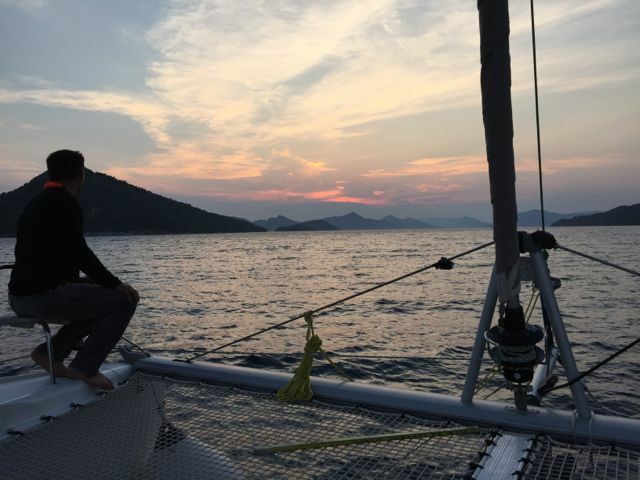 Another high point of the trip was sailing for three days on 45-foot catamarans through the islands along the south coast of Croatia. One cat was named “Tom Sawyer” and the other was “Huck Finn.” Our captains were expert sailors and the waters were calm as we cruised along the blue Adriatic sea. I was entranced by the whole experience. Every other time I’d been on a small boat before, I had been seasick. This time it was, as they say, smooth sailing and I loved every minute of it (except for ship toilets, which are decidedly icky). The Tom Sawyer, moored at Sipan Island, Croatia with bikes ready to go. The cats, which carried hybrid bikes for us to use onshore, would moor in crystal clear waters of the harbors of small islands. We’d sleep on the boat and play onshore during the day. My favorite island was Sipan, where there were first rate restaurants, a small, picturesque village, and a bike path that made traveling the island a breeze. The last few days of our trip brought us to the ancient city of Dubrovnik at the southern tip of Croatia. We stayed in a small village outside the city where we were hosted by a very friendly family who ran both a hotel and a taverna. We toured the walled city of Dubrovnik, whose history and re-construction are truly a marvel. But, unfortunately, the city was completely overrun with tourists from the three or four cruise ships parked in the Dubrovnik harbor. One evening back in the village, Erin and I had dinner at a small restaurant across the harbor from where were staying. After we enjoyed e couple of glasses of superior Croatian white wine, the waiter brought a plate of appetizers, I was surprised by its strangely sparse arrangement. Photo below. I think this happy face is a good way to end this chapter, as our tour ended in Dubrovnik, and we all said our goodbyes. I would depart for Crete the next day.